It’s time again to get the ivy and other vines off of and out of the trees. Vines should simply not be allowed to grow on trees. In the tops of trees, the vines reach out beyond the foliage and block the sunlight. With sunlight cut down, photosynthesis is reduced and tree health suffers. Plus it just looks messy. 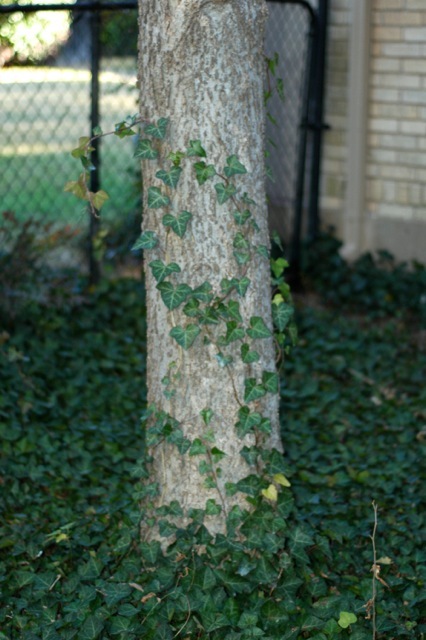 English ivy and other clinging vines and groundcovers are also a problem on trunks of trees. First of all the foliage blocks light and air, limiting the breathing that bark is designed to do. The vines collect organic material in the form of loose bark, dead leaves, dust and other debris. This mixture creates soil that collects in crotches, but worse, it builds up on the root flares of trees. Long term this creates a condition similar to trees being planted too deep in the ground. Girdling, rot and even death can result. At the very least, tree health and growth are reduced. Some people say it’s okay to leave these plants on the trunks of trees. Their advice is very bad. I used to make the same mistake. This is an important fall/winter maintenance procedure for everyone with trees. Remove all vines and ground covers from trees completely. 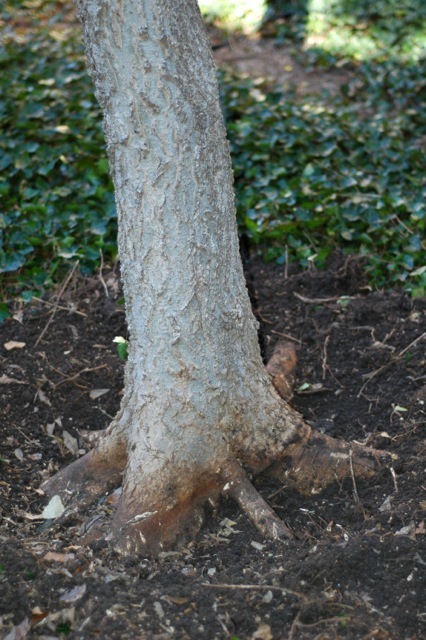 Also remove the plants from at least 12" around the base to expose the trunk/ root flare. If soil and/or mulch are covering the flare, they should be removed as well. See Root Flares. You will be fascinated how much this procedure improves the health and growth of your volunteer trees. Here's some useful information on Planting Trees, Treating Sick Trees and a video on the vine issue.